It’s common to see PDF files that contain multiple languages – like product assembly instructions. Usually these documents contain a sequential layout of the translated pages (i.e, English on page 1, French on page 2, etc.). But, this type of layout can be time consuming to navigate, especially if there are many different languages. So, instead of building documents with sequential access consider building multilingual documents with direct access to each a language to increase usability. In this example, I have two separate language files – English and French. So, I’ll start by creating a new blank page (Ctrl + Shift +T on Windows or Cmd + Shift + Q on the Mac) in Acrobat. 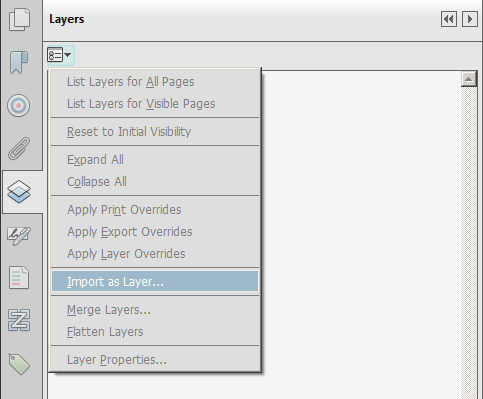 Next, I’ll open the Layers Navigation pane on the left and select Import as Layer from the Options dropdown menu. In the Import as Layer dialog select your default language file (in this case English) in the Source section and name the layer in the Import Options section and click OK.
Repeat this step again for the other language file – in my case French. Next, right-click to select Properties from the context-sensitive menu for the French layer. Select Off from the Default state: dropdown and click OK.
Next, we’ll create a button that can display the French layer. To start, click the eye next to the English layer to turn it off. This is how we want the document to look when selecting the button to display the French version. To create a button, open the Tools pane, Interactive Objects panel, and select the Add Button tool. Move your cursor onto the page and click to place the button on the document. Click the All Properties link and under the General tab select Visible but doesn’t print from the Form Field dropdown. Next, move to the Options tab and choose Label only from the Layout dropdown and add French to the Label area. Then, click the Actions tab and choose Set layer visibility from the Select Action dropdown and click Add. 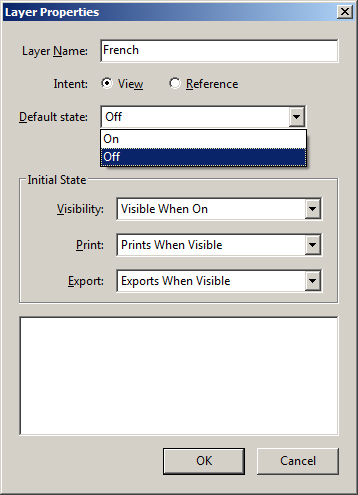 Click OK in the information dialog and Close the properties dialog. Next, create another button using the same technique to switch the language back to English. Remember to turn the French layer off and English on before creating the button. To test, select the Hand tool and click the buttons. If you would like to learn more about layer techniques in Acrobat XI check out my session on Working with Layers in Learn Acrobat XI on Udemy.com.